Photo by Tom Rivers: The bridge on Route 18 over Oak Orchard Creek is pictured last week. The bridge was limited to alternating one-lane traffic. 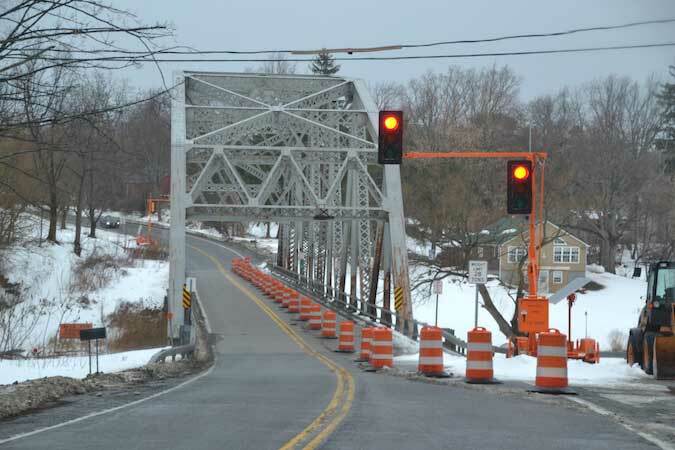 CARLTON – The New York State Department of Transportation today advised motorists of a short-term closure for the bridge on Route 18 over Oak Orchard Creek. Earlier this month, traffic was reduced to a one-way alternating pattern using a signal at each end of the bridge. The repairs, which will begin on Friday, are expected to last approximately one week and will restore traffic over the bridge to two lanes. A detour will be posted for motorists while the bridge is closed for repairs. The stretch of Lake Ontario State Parkway west of Route 98, which is currently closed for the winter, will re-open temporarily to accommodate traffic during the bridge closure.